Animals are a big companionship. I have had very few pets, but I've learned that are always there, give us support, are unconditional. Animals do not speak, nor cry or laugh, but if they feel and our mood affects. My parents do not like having pets, say they do much damage, garbage and bad smells. And it takes a long time and love to share with them. I remember that I had a fish, the tank was in my room, and was a very sad day, I did not want to do anything or talk to anyone and I shut myself in my room and the next day dawned the fish died. Attention and love are the most important thing for a pet. some of the things with which i’m disagree, is when with the animal skin make shoes, bags,coats or furniture for us.doesn’t matters which animal class be , they feel like us and we have to love and respect them. 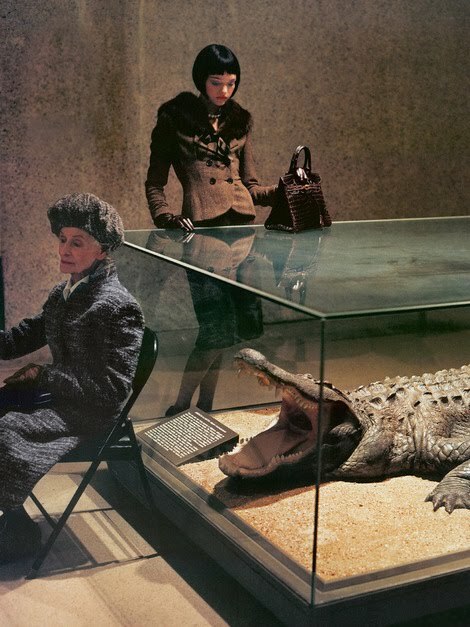 I was shock when i saw this image of one of the must importans brands in worldwide, when they were humiliating the poor alligator in his campaign to promote the handbag. To me is so sad the way of promote a product taking the animal that was made. love for animals should not only be for our pets or cute animals, should go over there with animals that we don’t loved or that scare us a bit. 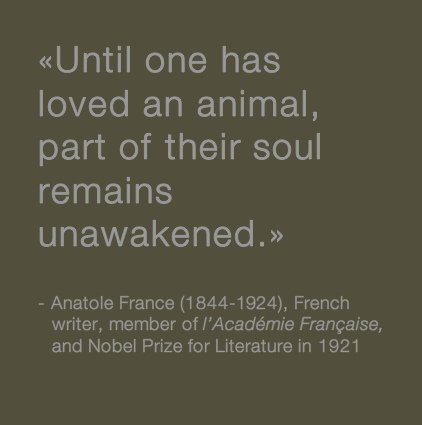 And if important and notable people say this things about animals...why we haven´t understand it? why we still thinking that they are nothing? Animals are the perfect company! Are always with you and are willing to listen. This first image that I want to show you is a phrase of mahatma Gandhi. Why? Because when a nation knows how to treat the animals and plants is reflecting their nobility, is giving a sample of how the nation is really like. The animals become a big part in our lives, they can demonstrate loyalty, love, joy .... Pets never leave us alone, are man's best friend. The animals fill a place in our hearts and can take huge empty! I think all they have the ability to remember, love, feel the absence .... Pets become part of our families, our homes. Sometimes I wonder: Why invest all that time and money talking about kindness to animals when there is so much cruelty to men?. To which I reply: I'm working on the roots. "George T. Angell. The animals they provide, love and affection....... We must answer their needs and protect them !! it’s true what ana maria says, only love which is not betrayed and is always true is that of an animal; many of us are lucky enough to enjoy the company and the love of these, I have a dog and I love him, I would never be able to hurt, it's part of my family and my life. Animals, they’ve been around all our lives the ones we relate most with are pets or domesticated animals that means that they can be around humans without hurting them and most likely finding a friend in them. I believe that an animal’s love is the only one that won’t betray you of course that depends on how you raise it, if you teach the animal well and care for its very likely that the animal will respond well to you. 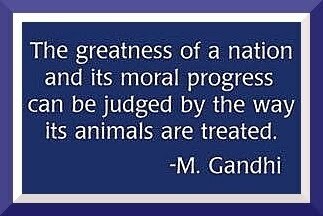 But if you treat the poor defenseless animal with hate then it’s probable that the animal will treat you the same way. A dog is probably the most loyal pet you will ever have they give and give and only expect you to feed them and to give them love. Pets influence a lot in peoples lives and most of the time it’s positive. I'm agree with Diana when she says that the dog is the most loyal animal that we could have, but, as far as knowledge of the subject is concerned that when you give to an animal a beating, and you wait around five minutes this animal just forget what you did and continues like nothing happened. I explain this basing me in the normal animal's behavior, not for my own experience, ( I never had beat an animal). I consider this is the reason to the violence with them, because they can't protect them of the same way like us, and furthermore, they are gonna love us despite what we do, if it is wrong or right, that doesn't matter for them. They will be at our feet, independent of everything they are going to stay and love us. I think it's the purest love that can exist, because we know it's hard to get them and also disappointments also received by them only love that can never be found ... are good friends and do not listen to us critique our situations, also become faithful friends and irreplaceable. For many people the dogs are just animals, but for me they are more than that. This little beings give us their company, and although many people don't think this way, they give us they love and they are loyal friends. That's why I don't agree with people that mistreat them or leave them on the streets, because they have feelings and some people aren't fair with them. And imagine that there are people who treats them (animals) like trash... because they are ignorant enough to believe that because they don't talk, animals can't feel or understand what is around them ! I hope taht wiht this video, I can help you too take a few of conscience, and make you strat to safe this world that isn´t only yours... One person can make the difference... and you can be that person, the lives of the entire species are in your hands. I have a nice story to tell you. It happened in Barbosa. On January 6th, my sister lost her dog called Puca, she was very sad and with her husband start to go in search of Puca. They went to the Radio station, put photos everywhere to offer reward who find Puca. My sister is devoted of Maria Rosa Mystica prayed her with big devotion. Finally, after three days Puca appeared and my sister had to fulfill a promise to the Virgin. It was don't eat Chocolate and ice cream which are her favorites desserts during six months. becouse how said gandhi " A society must be judged for the form in the one treats to his animals "
The bullfight is the maxim expression of the animal mistreatment, they also are alive beings, as we they feel, with the difference they are innocent, they are aggressive for nature; we are aggressive for a pastime. On having ill-treated to an animal we turn into low beings, insensitive beings and without heart. Animals deserve a good deal, not to be abused, as we feel and they also deserve a standard of care. Many people have pets they treat me wrong, I think this should have some sanction because they never give importance to animal abuse, and they are living beings and deserve to be cared for with love and affection. "It takes more than 50 animals to make a fur coat, but only one to wear"